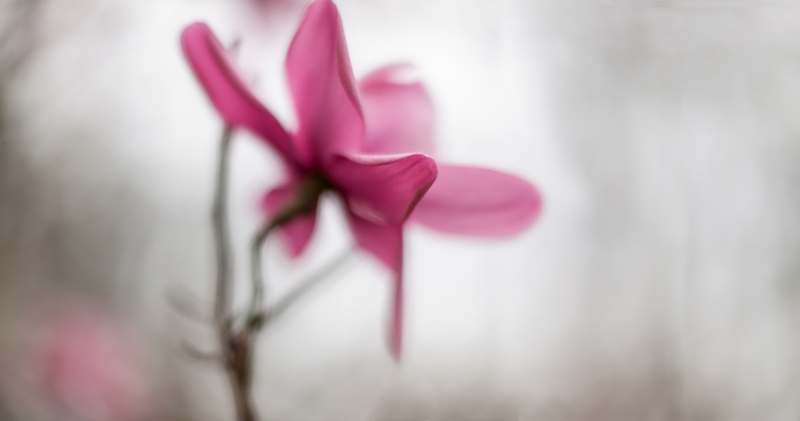 For some years I've been trying to capture the display of Magnolia Campbellii at Ventnor Botanic Garden. Every year I've tried to illustrate the on mass display and every year got frustrated with myself and the results as they look like images of a lot of flowers. This, of course they are but as with most images, to convey the three dimensional world with smell, sound, temperature etc in a two dimensions the images need to be "more than". This year started off the same way, I tried some panoramas shooting at 200mm to compress the image so the flowers would be more densely clustered, and though I imagine many people would be happy with the results they just seemed too busy for my aesthetic. The next day was a foggy one and it struck me that I could use this to my advantage. These Magnolias originate from the Himalaya and china so I could go for a more mysterious, oriental style painting, don't try and get everything in, go for soft subtlety and feel. Many times when photographing flowers you look for the "perfect" one, no blemishes, or torn petals but part of the beauty of these was that they fell apart so elegantly, like dying ballerinas. I shot them again as panoramas but very close with a wide aperture to soften the feel. The resulting images are very large ranging from 10000 to 15000 pixels wide so I'll never get to truly appreciate them unless they're printed but it's satisfying to think I've got closer to capturing their perfection.